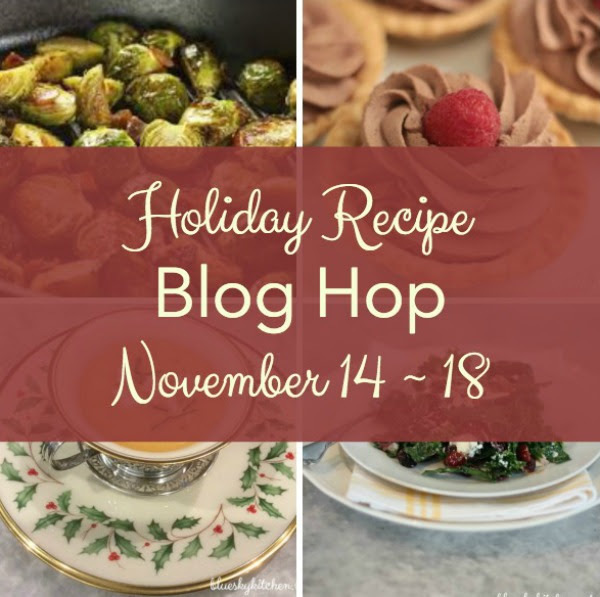 Carol, at Blue Sky Kitchen, organized this Holiday Recipe Blog Hop. I hope you will be able to visit all the wonderful recipes that were shared. Thank you so much, Carol! 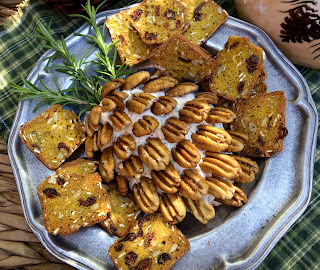 It's been so nice here in Texas and I can still enjoy time on the patio with a tray of my very favorite cheese ball , with some Cranberry Pumpkin crackers from Trader Joe's. I made a mini version of this cheese ball to share today. 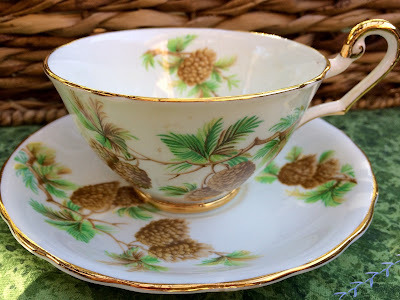 It's not too early to use my favorite pine cone teacup, by Clarence, Bone China . I've been making this family favorite cheese ball for so many years now. The recipe comes from Southern Living. I usually make a large pine cone and then a small one for the kids' table. I hope you try it and enjoy it as much as my family has. Mix together the first four ingredients. Shape into an oval, or ovals, if making two. Chill two hours or overnight. Place cheese ball onto a platter and arrange pecan halves over cheese oval, overlapping rows, beginning at the bottom and working up. Arrange rosemary sprigs at the top of the pine cone. Serve with crackers. What a pretty cheese ball. I love the pinecone design ;) And your pinecone teacup is perfect for fall. It's nice to see patterns of a different sort on teacups. Have a wonderful Thanksgiving Kitty! Such a pretty setting and your china is beautiful. I am always searching for a tasty and pretty cheese ball, I like the idea of make a smaller one too. Pinned to my Nibbles board! I have so enjoyed this friendly and inspiring Holiday Recipe Blog Hop! Good Morning Kitty, Your setting on the patio is fabulous. I love this recipe and can't wait to try it. Thank you for the print version. Your teacup is gorgeous. Love the sweet pinecone candlecup too. Oh Kitty, of course you have the perfect teacup to match your pine cone cheese ball! It sounds very tasty, and I love the idea of making different sizes to suit your needs! I bet it's great to have a little leftover in the fridge for future snacking! Pinning to try very soon! Happy holiday blog hop! Kitty, this looks delicious! I am definitely going to make this. Thanks for sharing the recipe. You have displayed it wonderfully. I love the pretty pine cone teacup!!! I hope that you have a great day!!! Kitty, what a pretty appetizer to set out for the holidays. Don't we love our pecans in Texas!. Thank you for being a part of the Holiday Recipe Blog Hop. Good morning, lovely Kitty! Oh, I just love the addition of the pecans in this cheese ball - YUM! Have you made this before, but with slivered almonds?? Wishing you a joyous weekend, my friend. Sending lots of love your way! Kitty, first off... cute blog! I love this simple appetizer recipe. Thanks for sharing! Happy Holidays! Great tip using softened cream cheese. The presentation is adorable. I love your pin dishes and the cheese ball to match. Precious. Maybe I'm behind the times, but I haven't seen a pinecone shaped cheese ball - I love it. I'm going to veganize and make one! Thanks for sharing! That is the cutest cheese ball! I am in charge of crudités for Thanksgiving and I am thinking this would be a nice presentation. Timely! Thank you, Kitty. Oh how cute! I just love theme ideas and this one is definitely a keeper! The cheese ball looks delicious! And your tea cup is very pretty! I haven't made a cheeseball in ages and yours is decorated so pretty. It makes sense that you pair your pinecone teacup, pot and candle on your tray. 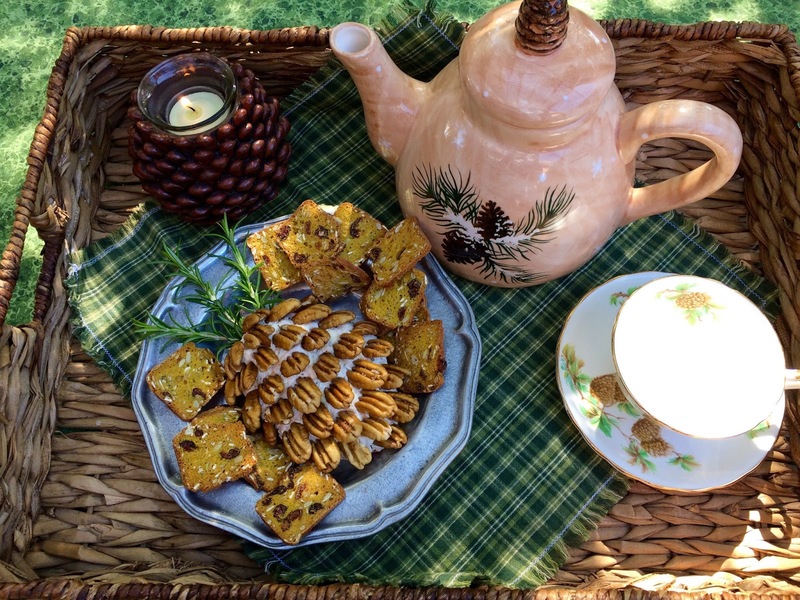 How perfectly this cheese ball goes with your darling pinecone teapot, Kitty! You are always so creative in your displays. Your cheese ball is so cute and would be a hit at any party. Very neat tea cup to match your theme. Kitty, the TJ crackers are favorites here. We buy them every season available. The cheese ball looks festive and delicious. How adorable with your cup and saucer! Happy Thanksgiving! I love eating cheeseballs at parties. I don't know why I don't think of making them for us to have here at home. Your presentation looks easy and fun. Your recipe is going on my to-make list. That's such a pretty pine cone cheese ball, and it sounds delicious. A great recipe to bookmark for the upcoming festivities. Your pine cone cheese ball is the cutest and you have the perfect teacup to match. I love a good recipe for entertaining. I have never heard of TJ crackers. Thanks for sharing your lovely recipe and post at DI&DI Kitty. I hope your Thanksgiving is blessed. Hi Kitty, your pine cone cheese ball looks wonderful and delicious. This is perfect for Thanksgiving. What a pretty cheese ball! Love your pine cone cup and saucer. Thank you for sharing at Monday Social. That looks so cute and yummy! I was a little slow to grasp the pinecone part of your yummy cheeseball. HA! Happy Thanksgiving, Kitty! P.S. Forgot to mention that you coordinated the pinecone cheeseball, teacup and teapot beautifully! This looks delicious! What a pretty tray you made with the pinecone theme. I love the teacup! So nice you're still able to sit outside. We went from 70 on Friday to 30 Saturday night! I think winter is here. Even a little snow on Sunday. I do like cheese balls. Happy Thanksgiving. Chick Cheese Ball and November Birthdays!